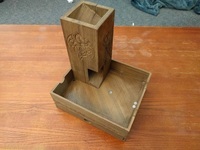 12mm Dice Holder by kriegs is licensed under the Creative Commons - Attribution - Share Alike license. 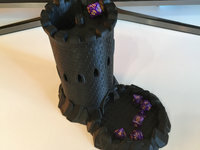 I was browsing Thingiverse earlier this week and came across the D6 Token by runswithscssors and thought this would be great for Warhammer gaming. The group I play with all use 12mm Chessex dice not only for rolling each turn but for marking wounds on units and for labeling mysterious objectives. The problem when playing is sometimes these dice get lost in the shuffle of a roll or knocked over. 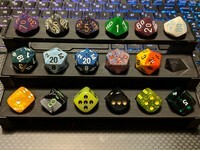 Thus, dice holders! I've included two versions: one with an arrow marker and one without. Say thanks by giving kriegs a tip and help them continue to share amazing Things with the Thingiverse community. 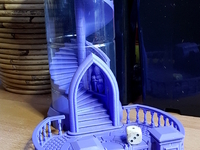 Say thanks and help kriegs continue to share amazing Things with the Thingiverse community. You'll need a PayPal account to tip kriegs. Click the button below and you will be redirected to PayPal. Once the payment is complete, you'll be brought back to Thingiverse.